As the contest on the floor continued, the rise of index options remade the market. 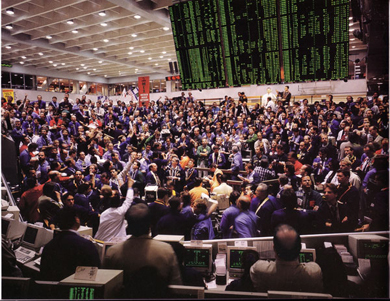 In 1982 the Chicago Mercantile Exchange introduced futures based on the Standard & Poor's 500. In March 1983 the CBOE followed suit with options trading on the S&P 100 index. These index options were popular, as they allowed traders to speculate or hedge on the movement of the entire market. (85.) Wall Street Journal, April 3, 1984; Wall Street Journal, December 14, 1987, and January 8, 1988; CBOE Annual Reports, 1991 and 1993; New York Times, April 24, 1988. (86.) February 1988 The October 1987 Market Break: Report by SEC Division of Market Regulation, 8.1-8.23. (87.) CBOE Annual Reports, 1975, 1989, 1990, and 1994.